Also known as the yellow or mud catfish, the flathead catfish is a large, smooth-skinned fish with a yellow to purple-brown body and whisker-like barbels around its mouth. It was introduced to the region in the 1960s, and is now considered an invasive species. The flathead catfish has a yellow to purple-brown body that is often mottled with black or brown, with a pale white to yellow belly. Its smooth skin lacks scales. The head of the flathead catfish is wider and flatter than that of other North American catfish species. It has whisker-like barbels around its mouth, and its low jaw protrudes farther than its upper jaw. The tail fin is slightly notched and may appear square or rounded, unlike the deeply forked tail of the blue or channel catfish. Adults can reach length of three to four feet and weigh more than 100 pounds. Flathead catfish are ambush predators that feed at night and wait under cover for prey to cross their path. Their varied diet includes insects, crustaceans and other fish. Adult flathead catfish have few natural predators. 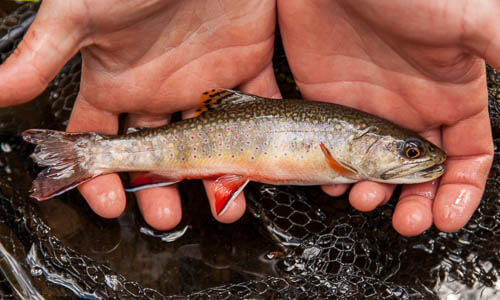 Spawning occurs in summer. Nests are constructed under cover, like logs, stumps, brush piles or rock outcroppings, and can contain up to 100,000 adhesive eggs. Fertilized eggs hatch in six to nine days. The male flathead catfish protects the eggs and young. 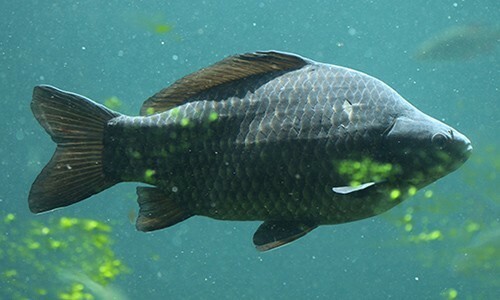 These fish can live up to 28 years, although most live to be 5 to 22. The flathead catfish's scientific name comes from the Greek word for “mud fish” (Pylodictis) and the Latin word for “olive-colored” (olivaris). Flathead catfish are a popular recreational catch. 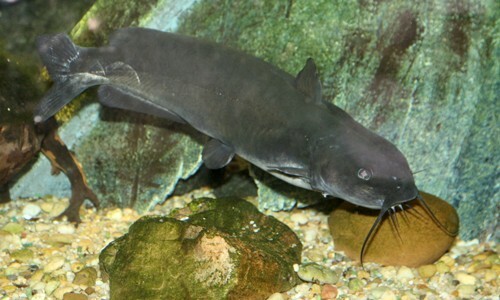 These catfish were introduced to the region in the 1960s, and are now considered an invasive species. Their growing numbers and rapid expansion throughout the region have raised concern about their potential impact on menhaden, blue crabs and other native species that play an important role in our ecosystem and economy. In 2012, the Chesapeake Bay Program’s Sustainable Fisheries Goal Implementation Team adopted an Invasive Catfish Policy statement, which outlines the need to control the effects of these nonnative fish. The Goal Team’s Invasive Catfish Task Force hopes to manage their spread while keeping in mind their recreational value.